45 ¾ x 35 ¼ in. After serving in World War I, Abraham Rattner, the American-born son of a Russian rabbi, returned to Paris on a fellowship to study art. He remained there for nearly 20 years, and became heavily influenced by both contemporary abstract trends as well as more historic styles. His simplified forms, especially those later in his career, recall Romanesque and Medieval traditions. 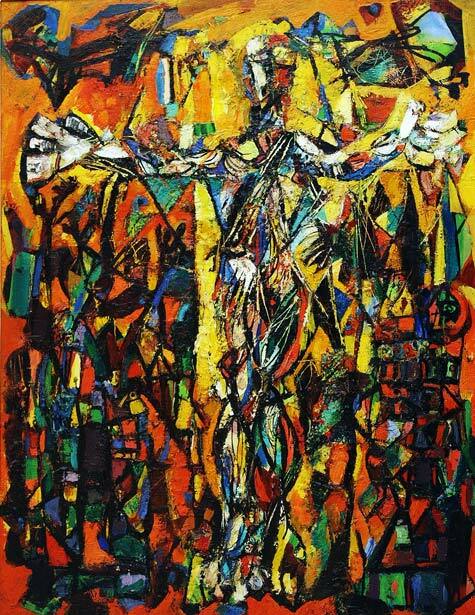 In this painting, Rattner combined bright jewel tones with thick black outlines, like the stained glass windows he admired at the cathedral in Chartres, France.